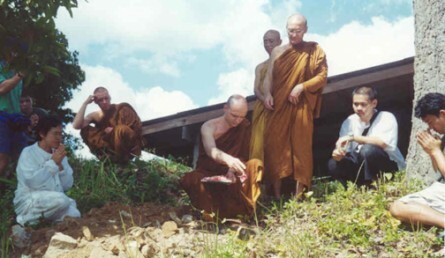 The Earth Treasure Vase buried in a vast and wild forest near the Burmese border in Thailand, was stewarded by renunciate monks in the Thai forest tradition of Ajahn Chaa. Ajahn Pasanno and Ajahn Amaro of Abhayagiri Monastery in Northern California requested the vase to protect this pristine forest under siege from drug trafficking, potential development, and civil unrest spilling over from Burma. Dtao Dum Forest was becoming a very dangerous place to go every rainy season to practice meditation in solitude. Nine years later, in April 2009, we interviewed Ajahn Pasanno for this video. That morning, looking through his files, he found many photos of Dtao Dum taken over the years by, Piyamongkol Jotikasthira, a professional Thai photographer. The images seen in this video give a small hint of the gorgeous vistas surrounding Wat Pah Nanachat, the small temple in the towering rainforest where the monks practice for 3 months each year following the tradition of the Buddha. We are happy to report that Dtao Dum Forest is still protected nine years later! In the fall of 2000, Cynthia Jurs and Wendy Johnson delivered an Earth Treasure Vase to Ajahn Pasanno, co-abbot of Abhayagiri Monastery in Northern California at the suggestion of a mutual friend and Buddhist teacher, Ralph Steele. This is a Theravada monastery in the Thai Forest Tradition of the late Ajahn Chah, a highly respected teacher whose monastic disciples are all strict renunciates and live very simply. Every year they do a three-month retreat during the rainy season (just like the Buddha and his disciples) in a remote and wild forest in Thailand where they have been given land dedicated for this purpose. It is this land in Dtao Dum Forest — near the border with Burma — that is under constant conflict from civil war, prey to illegal drug trafficking and other dangerous activities, and very vulnerable to development and clear-cutting. Ralph, who had participated in one such retreat there, Ajahn Pasanno, and members of his community all felt the need for protection and when they heard of the Earth Treasure Vase practice asked to take one there. The first ceremony to fill this vase occurred at Abhayagiri Monastery, with the whole community making the most generous and amazing offerings ever witnessed in an earth treasure vase ceremony – especially remarkable because the community is one of renunciate monks and nuns. Offerings included Buddha relics that had multiplied inside of a crystal stupa, a very rare and precious amulet made by Ajahn Chah (we were told these could be traded for a new Mercedes Benz in Bangkok), a black onyx turtle, and much, much more. After the ceremony, the vase was formally passed to Ajahn Pasanno who took it a few months later to Thailand and the temple Wat Pah Nanachat in Dtao Dum Forest. About 40 to 50 people made the rugged journey into the forest for the ceremony. The road in to Dtao Dum is extremely rough and everyone had to come with 4-wheel drive vehicles. They were accompanied by about ten or twelve soldiers because there had been quite a lot of conflict along the border and there was concern for both the Westerners and those from Bangkok. All the soldiers carried M16’s. Just before they arrived, Tivapon, a lay practitioner who has a special connection to the area and was instrumental in helping to protect the forest there, had been appointed chairperson of a high profile committee (consisting of both governmental and non-governmental agencies) in Kanchanaburi Province for protecting the forests along the western border of Thailand. This was considered a very good sign, as she would be chairing meetings and making influential contacts to continue helping the monks. Ajahn Pasanno reported: “On December 2nd, after consulting with Tivapon, it was decided that the best place to put the Earth Treasure Vase would be outside the upper sala (pavilion). This was considered to be the most powerful spot as it is a place overlooking the valley and many devas are gathered there. We began with letting people approach the Earth Treasure Vase and then they made offerings, which included Buddha relics and several amulets, some encased in gold, which people took off their necks (i.e. their own personal ones). Also, thin plates of brass and copper with auspicious signs engraved in them were offered. A few people who were not aware of the nature of the ceremony were disappointed, as they had left all valuables in Bangkok. Some offered coins recollecting the King’s image that was on them, invoking his power to help protect the land. One person put in a pack of cigarettes with the resolution to give them up completely. 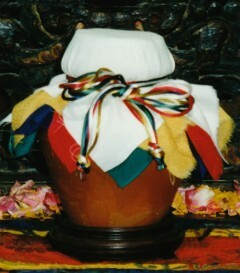 “After chanting the verses of protection and auspiciousness, the vase was sealed with beeswax and a Buddha image affixed to the side. Everything that had been offered since Abhayagiri, except for the exceptionally large things that didn’t fit anyway, all managed to fit into the vase. 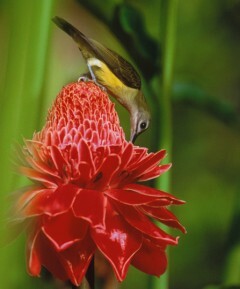 Just before taking it to be buried, the vase was given to Tivapon. She lifted it to her head and began chanting a blessing that came from a protective deity who lives nearby. That is, the deity spoke through her. “We then placed the vase in the hole that was dug at the end of the chanting. Before digging the earth, incense was lit and permission was asked of the protective earth deities to place the vessel there. After the vase was put into the hole everybody took turns putting flower petals and fragrant blessing water on top. While the earth was shoveled in, the monks chanted the victory blessing jayamangalagatha. This entry was posted on Thursday, June 6th, 2013 at 12:46 pm	and is filed under Burials. You can follow any responses to this entry through the RSS 2.0 feed. You can leave a response, or trackback from your own site. 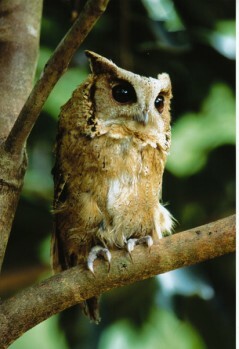 I’d go to Thailand just to see that owl – awesome blog and amazing images – cheers! Thanks so much for visiting our site and for your kind words. If you feel an affinity with this particular ETV and the Dtao Dum Forest, we would invite you to join our monthly full moon meditations from afar. Check out the guided meditation…and direct your prayers to the ETV deep in the Forest. can i get an detail address of wat Dtao Dum ? and how about phone signal ? The best we can ever do is to know what’s going on. The rest will take care of itself. Just as you can never know the exact mneomt you fall asleep, someday you will notice that judgments don’t arise quite as spontaneously as they did or they are more infrequent. It is paying attention and noticing what is happening. When you do that, even if judgment arises (as it will), you need not pick it up as Ajahn Chah used to say. OK, judgment coming up. You acknowledge (without judging yourself) and move to the next mind mneomt. Seems like work perhaps, but eventually the mind trains itself and will do this automatically. We had that spell of nice weather a few weeks back and I found that I and many of my freidns couldn’t seem to appreciate it without statements like But we all know what’s coming, right? .Also, I was noticing recently that I am very quick to make judgments about people based on just a glance at their appearance and behavior. It seems almost impossible to avoid. Perhaps the best I can do for now is to be aware of those instant judgments and try to be more accepting. I’m Hendra Kwang from Indonesia. I’m interesting to visit Dtao Dum Monastry and wish to meet Ajahn Siripanno. May you advise me how can I go there from Bangkok. Anybody at there can help me? Thank you.